The euphoria seen in the states followed on into Asia with the Nikkei returning almost 1% in today’s trading. The mood did not want to change from Wednesday, leading traders to think that many have finally thrown in the towel and are accepting that we are moving higher. The strange thing is the odds move from 50% to 80% for a March hike and stocks rally. Are the majority finally ready to accept that rate rises are a sign the economy is improving and is good for stocks – maybe a look back at the history books as for many years this was often the way it was presented. We will hear from Janet Yellen on Friday and certainly the market will be looking for a yay or nay for a March play. Shanghai and Hang Seng were both negative in cash today down around -0.4% and remained weak watching futures fall another 0.25% in late US trading. Core European indices closed almost unchanged on Thursday after losing some early gains. All core opened better following the USA’s master class in buying markets, but all lost early leads to close around mid session levels and yesterdays close. The DXY continues to benefit from geopolitical uncertainties, interest rate differential and the much rumoured one-off corporate tax repatriation holiday (have to wait for more on this one). Gold and oil both suffered heavy loses today (around 1.5% – 2%). Gold mainly because stocks had rallied instead and oil because Russian output was unchanged despite alleged proposed OPEC cut agreement. After Wednesdays huge rally we saw some consolidation today with many quite happy to comply. Having just experienced the fastest 1000 point rally in history many are a little shell-shocked we hear. 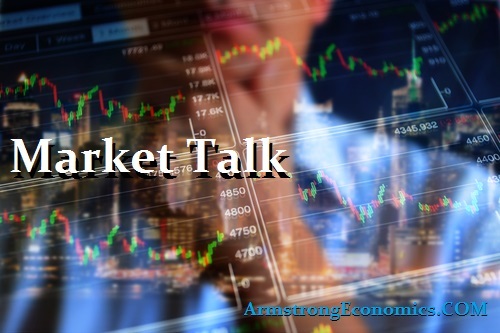 Initial Jobless claims were well below estimates and a little nervousness around financials eventually took their toll on the market and the DOW ended down around 100 points. Friday we have PMI’s from all around although are low on the table of upcoming events. FED will be watched and so will next Fridays unemployment numbers. US 2’s closed 1.31% (+3bp), 10’s at 2.48% (+2bp), Bunds 0.31% (+3bp) closes the US/Germany spread at +217bp. France 0.92% (+1bp), Italy 2.12% (+1bp), Greece 6.81% (+6bp), Turkey 10.76% (+10bp), Portugal 3.90% (+1bp) and Gilts 1.21% (+2bp).